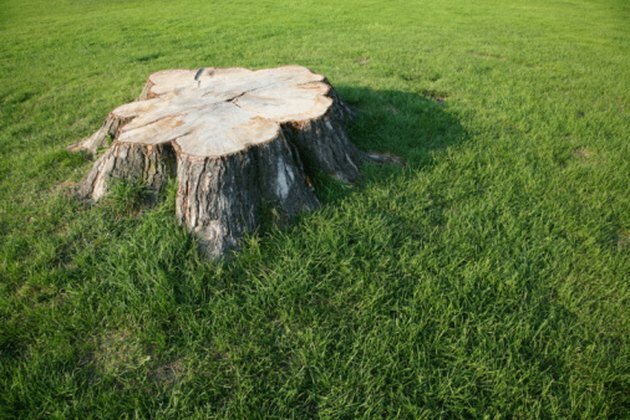 Tree stumps in your garden or landscaping provide you with a world of earthy possibilities. By hollowing out your tree stump, you can create a bird bath, planter, fountain or eye-catching piece of scenery in your garden. With the help of a couple commonly used tools, you can turn your old stump into a new creation. Hollowing out a stump is a labor-intensive job. Soften the wood of the stump. Wait for a day after a rainstorm when the wood will be softer and more pliable after absorbing water. This is not necessary, but will make the job easier. Drill holes across the section of the stump you wish to make hollow. Space the holes a few inches apart throughout the entire section. Hollow out the stump with your hammer and chisel. Chip away the wood beginning at the edge of one of the holes. Keep your chisel at a 45-degree angle. Remove the wood and place it in a compost pile, recycle pile or use it as mulch. Smooth the hollowed area. Clean up the hollow by chiseling away the jagged sections of wood. Smooth the edges and bottom of the hollow with course-grain sandpaper. Wipe away any debris or dust from your work. Stephi Peppers began her writing and editing career while in college at Emory University, where she obtained her Bachelor of Arts in English and creative writing. She has been writing since 2000, with published articles on various websites. Peppers has also grown a body of proofreading and editing work with an array of formats ranging from thesis papers to children’s books.